The struggle to protect your wild horses is continuing on many fronts. Our friends at Help Alberta Wildies continue make everyone aware of the negativity that abounds in the ESRD and other groups about these beautiful creatures. No one that cares, can let the pressure to have the wild horses afforded better protection and more humane treatment fall silent. So we hope that you continue to let your voices be heard. We still suggest you contact your local MLA and let them know how you feel, no matter what party they may belong to. Here is a link to allow you, no matter where you live, to find the contact information for your MLA. Ask them that the laws be changed so that the wild horses are afforded better protection and therefore assuring the overall welfare of our herds. 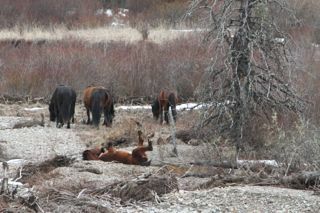 When the count for the Sundre area was revealed I was shocked, and again scared, that we may have lost so many of our beautiful wild horses. On Tuesday, April 1/14, one of our members flew with ESRD staff over the Ghost Equine Zone for the count. This area had the second highest count in the 2013 census. I was quite relieved to hear that the number of wild horses is up in this zone, as I worried greatly that if that number was down too, your Alberta wild horses were in trouble. Thanks to a very long and exhaustive flight by the ESRD, the area was covered extensively. One thing that was noted was that there was quite a bit less snow throughout this area which probably assisted the survival rate of these herds this winter. The overall count for all zones will be forthcoming. When talking to some of the opponents of the wild horses and staff at the ESRD it is clear that they still carry old notions and prejudices. What was maybe okay in the past is not okay in today’s world. The next link is for a letter written by a member about this point. It is time that we moved forward with policies surrounding all our wildlife and the wild horses. 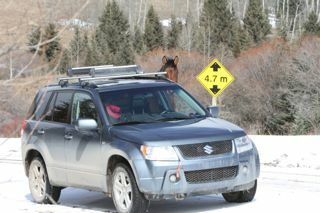 No longer can we afford to allow a few individuals dictate to Albertans how our wildlife will be managed. 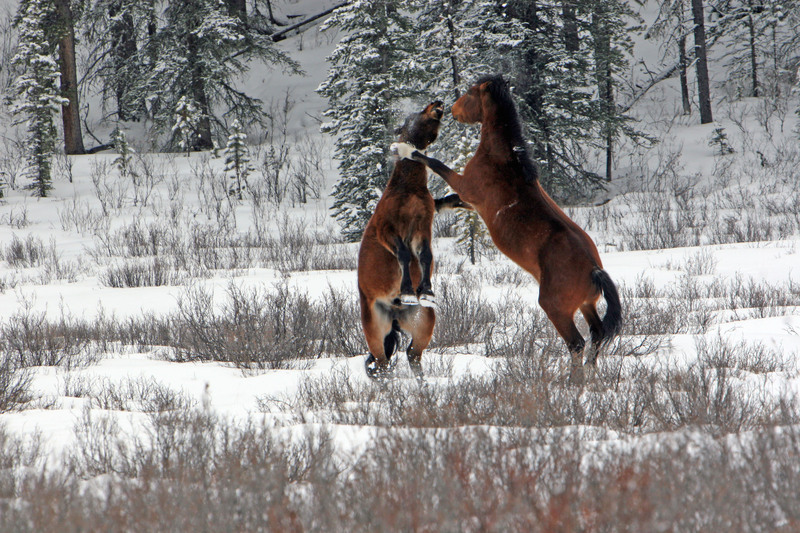 A lot of the management strategies concerning caribou, grizzly bears, wolves and wild horses are based on old and inaccurate science. Mom what are those strange creatures? 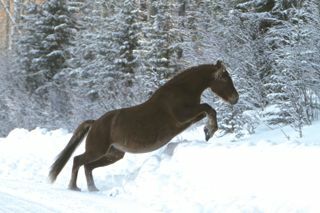 As you have maybe seen from the other wild horse sites, a few foals have made their arrival into this forever winter. It is amazing how these wonderful little creatures survive under such adverse conditions. One thing I have noticed over the years is that indeed these earlier foals have a better survival rate than those born in the very wet month of June. By then these little ones have the strength and stamina to survive the heavy rains and problems it can cause in new born animals. As the weather warms and more forage is exposed, the physical condition of the horses will begin to improve and more beautiful foals will be born. We are truly grateful to all the emails and phone calls from the supporters of your wild horses which shows that these horses do matter to a majority of the public (us).